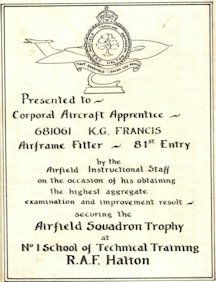 In the latter half of the 1950s there were two schools that trained Royal Air Force Aircraft Apprentices, No. 1 Radio School at Locking and No. 1 School of Technical Training at Halton. Selection of boys between the ages of 15½ and 17½, hoping to take up such apprenticeships, took place three times a year with courses starting in January, May and September. 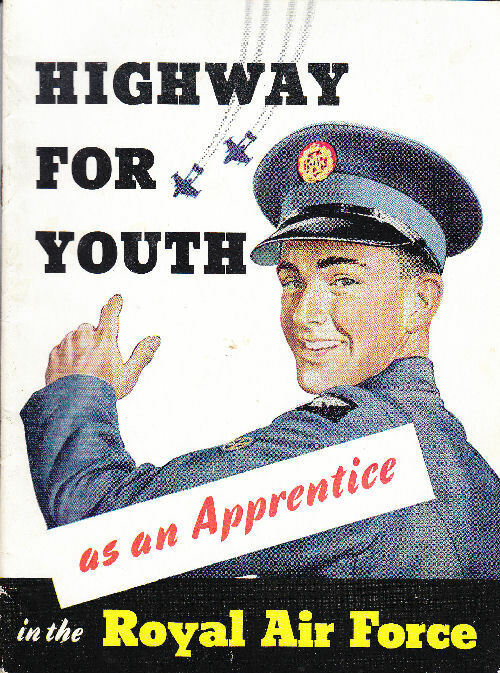 After applying a boy had to sit an examination and then, if successful, his parents/guardians were informed by mail and he was invited to attend RAF Halton for a medical examination, an aptitude test and an interview with a selection board; the latter two procedures being used to assess his suitability for training in a specific trade. A return travel warrant and full instructions were provided. A month, or so, after this attendance at Halton the boy's parents/guardians were informed as to the outcome of his visit and, if he had been accepted, they were informed about the trade in which he would be trained (assuming they were agreeable), comprehensive details about the school he would attend and the three-year course he would be part of. If all was acceptable then the boy should arrive at either RAF Locking or RAF Halton at a certain time on a specific day the following month; again a travel warrant and instructions were included. (If anyone reading this would like to see examples of the letters sent to parents/guardians I have copies of them that can easily be scanned and emailed). 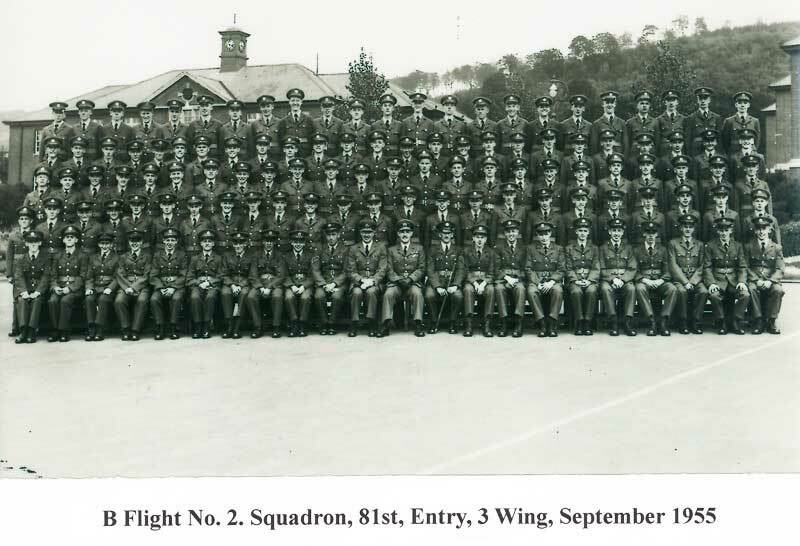 For ourselves, having been selected for training as fitters in the trades of Airframes, Engines, Armament, Instruments (Nav and Gen) and Electrical (Air and Ground), we were to report to RAF Halton on Sunday 4th of September 1955 before 4 p.m. (or, using military-speak, 1600 hrs). To nip ahead in time a few days, but keeping this as part of my Prologue; on the Thursday after we arrived, the 8th of September, a letter was again sent out to every parent/guardian - rather than scanning it and then inserting here I will type out the entire contents of this letter - it's one I cannot remember my parents showing me but it does answer many questions that have been asked of me over the years. You will be pleased to know that your son/ward - 681*** A/A Bloggs - has arrived safely at RAF Halton. He will be in No. 2 Sqn, No. 3(A) Wing, with the other boys of his entry. The staff here is selected for its ability to teach and train boys with understanding and tolerance, and you may rest assured that his welfare will receive close attention. Your influence during his training will, of course, be of the greatest importance and I look forward to your co-operation. Your boy now has the opportunity to learn an advanced trade and to lay the foundation of a really worthwhile career. Every facility for this is available here and he will be given every encouragement and assistance. Provided he has the aptitude, works hard and behaves well, he should experience no difficulty in graduating with his entry. Although advanced Trade training and Educational training are the two main functions of the school, they are by no means the only ones. We realise that the years spent here will be amongst the most formative in your boy's life. Therefore, in addition to his technical and educational training, his health, physical and, above all, the development of his personality and character, will receive special attention. Our aim is that he shall acquire skill and knowledge of which both he and you may well be proud. and that he shall form habits of integrity, self-reliance and good manners. In this connection, great help can be given by the School Chaplains. Your boy could do well to become acquainted with his particular Chaplain. I wish to invite your attention to the desirability of helping the boy to form habits of thrift. During the first year of service his pay will be 17s.6d per week. This amount is increased with each year of service until your boy is entitled to an airman's rate of pay at 17½ years of age. He will then earn 7s.0d per day. Not all of this money is paid directly to the boy. Arrangements are made for each boy to have an account in the Post Office Savings Bank and a proportion of his pay is paid into that account. In addition each boy is encouraged to purchase National Savings Certificates. I would strongly advise you not to send the boy additional pocket money during term time, as all meals and many recreational facilities are provided and there is little need for more pocket money. The question of leave deserves particular mention. Official leave is given at fixed holiday periods - Christmas, Easter and Summer, and at Half-term breaks - and amounts to six weeks in the year. Furthermore, after his first term, he can obtain one 36 hour pass per month providing his work and behaviour are up to standard. This is, of course, a generous allotment, so please do not ask for your boy to be given any more, even at week-ends Odd periods of leave, however short, have a harmful effect on a boy's progress. Leave is, of course, granted on strong compassionate grounds when the presence of the boy at home is necessary and desirable. Civilian clothes must not be kept on camp but may be worn when on leave. Leave is only granted to an address approved by the boy's parent or guardian. Although it is permissible for apprentices who are above the age of 16 and have commenced their second term of training, to smoke when off duty, permission will only be given upon receipt of an individual application bearing your endorsement. In the interests of physical fitness and general good health of the boys, smoking is discouraged, and I trust you will bear this in mind before giving approval for your boy to smoke. "Apprentices are forbidden to drive cars or ride motor cycles during term time, or when proceeding on or returning from leave or pass." Recently a most grievous event occurred when two apprentices who were riding a motor cycle without permission, were involved in an accident in which both lost their lives. and not to any officer by name. This will avoid any delay in dealing with correspondence. If you wish to visit the School, I should be very pleased to see you. Perhaps, in this event, you would kindly give me a few days' notice to enable me to make an appointment. Accommodation for such visits is available at the Toc H Club in Wendover, at a charge of 9s.0d for bed and breakfast, as well as hotels in the town. IN THE BEGINNING, 5 SEP 1955. 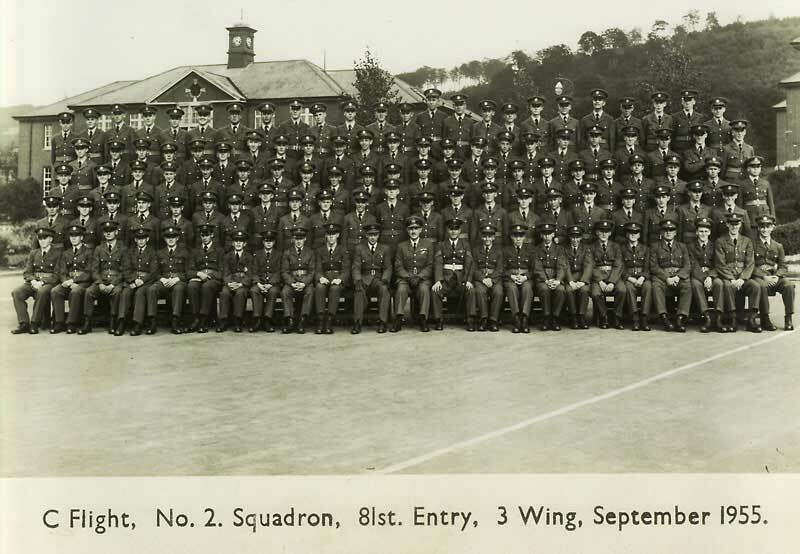 Over the years I have often been asked if I have enough information in my records to tell how many of us were in the 81st Entry when we joined on 5 September 1955 and how many of that number managed to graduate on 30 July 1958. Another favourite query has been "Did we really have, at some time, as many as 400 in the Entry?" Wg Cdr Charles T Kimber, in his book 'Son of Halton' quotes the range of Service Numbers for each entry from the 1st to the 127th giving, in each case, the lowest Service Number and the highest. He quotes the 81st as having a starting Service Number of 681025 and a finishing one of 681391 which, if my arithmetic is up to it, comes to a total of 367; however things are not that simple! The 56 numbers from 681336 to 681391 were never allocated to the 81st at Halton; I presume they were for the 81st at Locking but my attempts to contact someone who could confirm that have come to nothing. Left with 311 for Halton we were allocated 19 more numbers, 681431 to 681441 and 681452 to 681459, that I'm led to believe were late arrivals and ex Cosford boy entrants; that's not quite the end as we also had one ex Locking apprentice who kept his original number 680183. I am reasonably confident that the 81st Entry at Halton started off with a potential total of 331. Out of these 331 numbers I have names to go with all but 3 - I assume that those missing opted out at the last minute before signing on the 'dotted line' - so it looks likely that we started with a grand total of 328. I can break this total down into trades: 89 Airframes, 79 Engines, 80 Armourers (including 1 ex-Locking), 40 Electricians and 35 Instruments; the astute will notice that if you add those numbers together it only makes 323 - the missing 5 are those whose trade I'm not sure about (maybe you can help fill in the gaps). As for whether we ever reached the figure of 400: well if we ever did it would only have been by adding in those who had been recoursed from earlier entries. At the end of our first year 363 of us, including 47 who had been recoursed, sat the First Year Intermediate Examination (known as 'Inters') - that may well have been the largest we ever were. I have no information on losses and gains during our second year but doubt very much that we exceeded that figure. At the end of training 265 apprentices sat the 81st Entry final examinations; 40 of them had been recoursed from earlier Entries and 2 were foreign apprentices (see below). Just 223 of 'original 81st' were included in that 265; sadly we had lost a total of 104 between 'day-one' and taking our Final Examinations. I have records for the 17 listed below who went down to the 82nd, 83rd or 84th (for whatever reason) but little, if anything, is on record for the remaining 87. 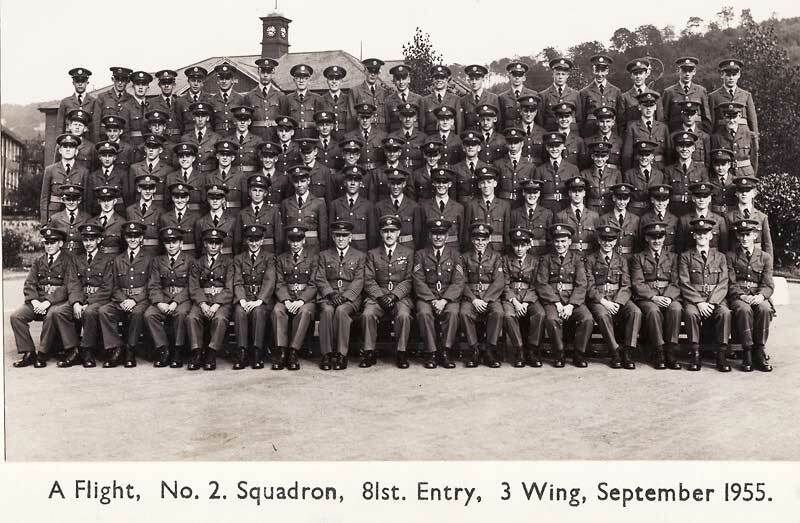 Taking examinations inevitably means that some will fail and 33 of our 'original 81st' did; so, at the end, only 191 of us who had been there at the beginning graduated and set off in July 1958 to join the real Royal Air Force. You will have noticed the anomaly in the above lists; there are only 190 names - 681185 Simkins JAH (Engines) definitely graduated 178th in the Order of Merit but was omitted from the postings list. I have no idea why this happened; does anyone have any idea either where he was posted to, or know of a reason for this omision? 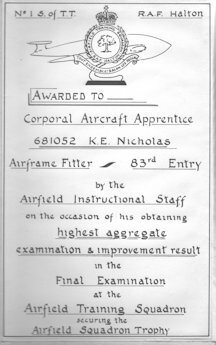 The 81st Entry started off with 331 aircraft apprentices and then, three years later and taking into account all the above details, a total of 220 took part in its Graduation Parade - just 190 out of the 331 were there, a loss rate of 43%. As the Commandant of No 1 S of TT, Air Commodore T N Coslett O.B.E. quoted at the time "This high wastage was the price which had to be paid for the maintainance of quality." The following paragraphs are taken from The Halton Magazine, Volume XXⅼ, dated Autumn 1958. 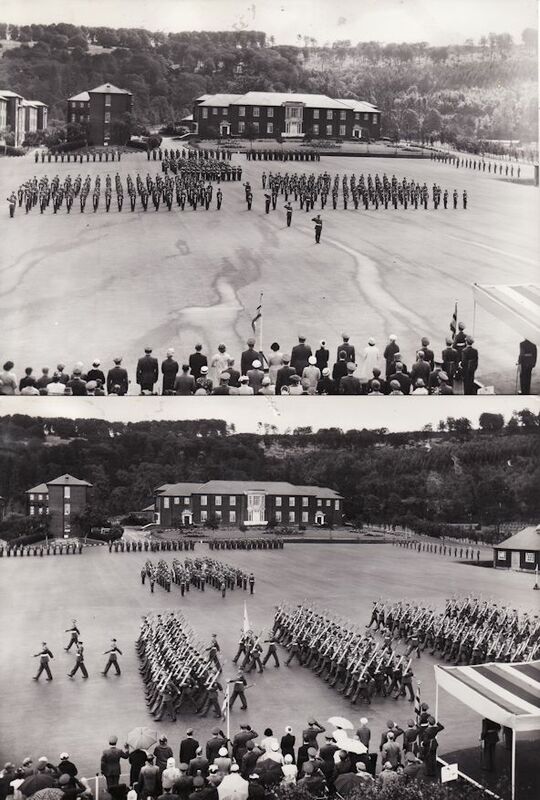 The Graduation Parade of the 81st Entry of Aircraft Apprentices at Halton took place on the Henderson-Groves Parade Ground on 30 July, 1958. The Reviewing Officer was Air Chief Marshal Sir Walter Dawson, K.C.B., C.B.E., D.S.O., Air Member for Supply and Organisation. He was accompanied by Air Marshal Sir Arthur McDonald, Air Officer Commanding-in-Chief Technical Training Command, Air Vice-Marshal H. D. Spreckley, C.B., O.B.E., Air Officer Commanding No. 24 Group, Air Commodore T. N. Coslett, O.B.E., Commandant of No. 1 School of Technical Training, Group Captain A. K. Hunter O.B.E., Senior Training Officer, Group Captain E. A. Stockwell, Principal Education Officer, and Wing Commander A. A. Pedder, Officer Commanding No. 1 Apprentice Wing. F.S/A/A H W P (Bill) Verdin. S/A/A P J (Pete) Perry. F.S/A/A H W F ('Hutch') Hutchinson. S/A/A M S (Mike) Johnson. Winner - F.S/A/A H W P (Bill) Verdin. Presented by the Royal Flying Corps and Royal Naval Air Service Ex-Boys' Association to the Apprentice who obtains the highest marks in all tchnical training subjects at the final examination of each Entry. Winner - S/A/A P J (Pete) Perry. At the 1936 Model Engineering Exhibition, held in London, certain examples of basic exercises carried out by Apprentices at Halton were on display. These exhibits were admired by a Dr Robinson and a Mr Crebbin who kindly offered a Cup for the best Trade Standards Practical Fitting Test at the final examination of each Entry. Winner- A/A R G Etsell. Mr R D Elliott was Sir Alan Cobham's ground engineer during his many flights to India and South Africa in the early 1920s. In 1926 Mr Elliott was killed during the first England to Australia flight. In 1927 a Memorial Prize was awarded by the Royal Aeronautical Society to be presented to the Apprentice who gained the highest marks in English and General Studies at the final examination of each Entry. On 13th August 1951 Flt Lt J A Quinton sacrificed his life in saving an ATC Cadet when both were flying in an aircraft which was involved in a mid-air collision. 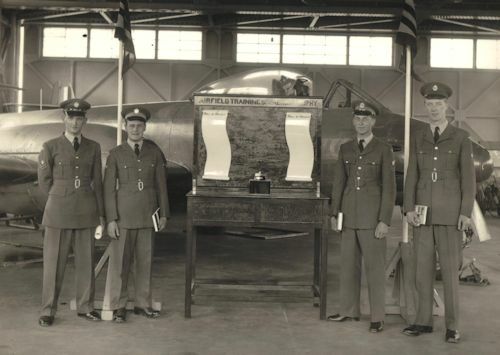 For this supreme act of gallantry Flt Lt Quinton was posthumously awarded the George Cross. As a mark of esteem all ATC Cadets at that time subscribed one penny per head so that the Quinton Memorial Trophy could be presented to the best all-round ex ATC Cadet graduating with each Entry at Halton. A/A R L (Roy) Roberts. I have absolutely no memory of this trophy being presented, or even of its existence, and it was only very recently that Ken has pointed out the error of my ways - if only that was all that had slipped from my grasp regarding those far off days! Anyway, now reminded, I have approached the RAFHAA archivist to find out more about the Airfield Squadron Trophy; nothing regarding it has ever appeared in my records or in my several old copies of the Halton Magazine. Ken is searching for photos both of the trophy itself and his presentation but in the meantime has written this interesting slant on it; I think it better here than as a Journal article. It was back in the mists of time! Was it really the year of 55 in the month of Sep, when the young man, of barely 16 seasons, first came to the hills called Chiltern? With him came over 300 others, including such worthies as Albert of England, Kingy of Guy, Ron of Furner, Robert of Longhurst, Sid of Fowler, Mickey of Dymond, Lawrence of Minton, Brian of Spurway, Bill of Morley, Steve of Parsons, Bill of Johnson, John of Hathaway, Alan of Humphrey, Graham of Enfield and Terry of Gaunt. Together they became known as the 'Entry of 81'. Nestling within these hills, there lay a hollow, containing the Wings of Yellow, of Red and of Blue; 'twas the hallowed Land of the Brats - Halton. In the beginning the Wing of Yellow was the place of dwelling for the Entry of 81. However demonic powers were lurking above, stirring the cauldron that contained this particular brew. Thus at Yuletide of 55 the Entry of 81 was stirred, agitated and blown about such that, although some remained in the Wing of Yellow, other came to rest in the Wings of Red and Blue. All this period of upheaval became known generally as the passing over of the 'Death of the Spirit of Entry', its manner proportionately affecting entries of a lower number than 81. At some later point during the Year of One, in the Wing of Blue, somewhere deep in the Barracks of Grove, the young man (and others) sat listening, wide-eyed, to an older man who wore his collar back to front, this man was known as 'Padre'. "Ye of year one", said Padre, "beware the Year of Two, the entry of 77 is in its clutches as I speak, they are suffering greatly from the malaise known as '2nd year blues' - doubtless most of them will survive - but brace yourselves - you also will there within dwell." The young man absorbed this with interest and decided, instead of fighting this malaise, he would embrace it wholeheartedly and thus not be undermined. It was a plan of undoubted cunning, it worked. Results from the Hall of Kermode and the Shops of Work were suitably degraded and the Year of Two was survived. In the Year of Three there was a phase defined by the donning of an outer garment known as the 'Mac of Trog'. The normal hazardous daily running the gauntlet of the Point of Main was heightened whilst wearing a Mac of Trog. One day, having successfully descended from the Square of Grove and Henderson (overlooked by the baleful Eye of Pimple), the young man was, without ceremony, removed from the safety of his accompanying flight. His persecutor was the evil troll (Sqn Ldr Taylor??) who lurked at the Point of Main looking for victims amongst those bearing the Ma(r)c of Trog (This happened despite the wailing of the pipes intended to ward off evil spirits). "Tell me", said the evil troll "is it because you are of the Entry of 81 that you wear your beret with its badge above the centre of your forehead instead of above your left eye?" The young man gulped and looked him squarely in the eye (did he only have one?) and replied "With all due respect sir, your beret is being worn such that your cap badge is over your left ear." (which was as great a sin as being over the forehead). This so threw the evil troll that, with a twinkle in his eye he said, "Touché - away with you to the Field of Air." Thus did the young man survive his confrontation with the evil troll - others were not as fortunate. Following the phase of Trog, safely back in the Airframe Shops of Work, much was the astonishment of the young man to learn that he had been awarded a prize related to The Field of Air (in fact a metal bird known as Victor). 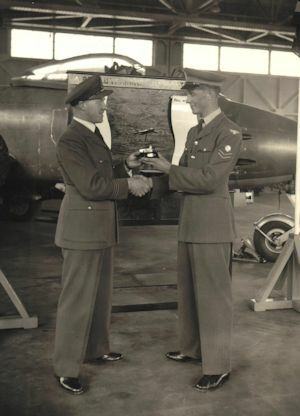 Apparently his joyful plunge into the '2nd year blues' and the appropriate lowering of his results therein resulted in his winning the 'Airfield Squadron Trophy', which took into account improvements between the Years of Two and Three. I wrote emails to the webmasters of the 82nd and 83rd to ask if anyone from either had heard of this Airfield Squadron Trophy and within a day or two Ken Nicholas, who had been medically re-coursed to the 83rd, contacted me; he was the 83rd's winner of it. Some coincidence this, two winners of the trophy, both 81st, both Airframes and both called Ken! I'm still waiting from he of the 82nd to respond. In his report at our Graduation Prize Giving, in the Burnett Gymnasium, the Commandant recalled that his predecessor had noted in the 80th Entry a much better spirit than in preceeding entries; he was assured by his staff that we had bettered even the 80th in this respect. In view of our good spirit and our sound attainment in training he believed that we were leading the way to a general improvement in the quality of the Halton Apprentice. In educational training our achievements were particularly gratifying with an average mark in the final examination that had been equalled only once in the post-war period and that had been six years previously. Some 20% of us had been awarded the Ordinary National Certificate in Electrical and Mechanical Engineering whilst in the General Certificate of Education 80 of our number had obtained a total of 102 passes. A further 2 had broken new grounds by taking Mathematics at G.C.E. Advanced Level (he didn't say they had passed!). These excellent results, he said, were a just reward for our keenness and diligence. We had shown an above average interest in the cultural (?) activities and hobbies run by the Halton Society, particularly in the Handicrafts Club and the Halton Branch of the Royal Aeronautical Society; apparently the churches would also miss our co-operation and enthusiasm. He rated us as comparable with preceeding entries in all other respects - trade and general service training, discipline and band activities. In the field of sport we had assisted in the breaking of 13 Halton apprentice records.